This is a movie I have seen many times before. But then, Cinderella is a story we have all heard many times before, and so is Ram and Sita, and the feuding brothers (well, cousins) at the heart of the Mahabharat and any number of other stories. Stories last because they work, because they get in at some basic part of the human psyche and force us to react. So I will always be worried that our team won’t really win when I am watching a sports movie, just like I will be surprised every time when the prince falls for the servant girl, or the father banishes his most beloved son. This is an interesting use of the sports movie template. Most of it is things we have seen before. Especially recently, especially in Indian film. Does it seem like Hindi film just discovered the sports movie in the last decade and now wants to make as many of them as possible as quickly as possible to make up for lost time? The general structure is always the same, you end with (SPOILERS!) winning the big whatever. And you start by establishing the every day noble Indian common man background of the characters. And in between there is the moment when the teammates/star player fight between themselves and then pull together and seemingly nothing can stop them, until they face a last minute obstacle right before the big match. And there is a wise coach somewhere and an eager young hothead with too much ego and blah blah blah. Chak De India is the one that created the template for the Indian version of this, which tends to go heavy on the teammate infighting and pulling together. Because that’s the beauty of the Indian sports structure in the real world, they are truly national teams, they are what brings this whole mixed up country together as fans, and a symbol of how people from all different places in this mixed up country can work together as one team on the team. This movie, now that I think about it, is really almost identical to Chak De India. Not just with the choice of field hockey as a sport, but with the focus on the coach and the team working together, and the players learning to pull together as one. But then, that’s also field hockey, right? I know almost nothing about sports, but I know the difference between the kind that has a team running back and forth together trying to hit a goal, and the kind that has one hitter. Cricket is about the batter and the pitcher, and then the other players. And yes, it is a team, and everyone is important, but there is also that moment when it is a face off between just two people. Hockey, soccer, basketball, even football, it is all about the team working together and any one member could be the person who gets the ball in the goal. It’s a good sport to choose if you want to tell a story about learning to work together. Or, maybe if you want to tell a field hockey story it has to end up being a story about working together, because that’s what the sport is. Even Soorma, which focused on one player rather than the team as a whole, was about his family working together and him working for them and somehow getting through to the goal as a group. Unlike Dhoni, which I also quite liked, but which was definitely the story of one person who couldn’t quite be understood by anyone else, who had to carry his own burdens and live his own life. What this movie brings that is new is this amazing sense of history. It didn’t have to do that, it could have taken the easy way out and simply gone for “rah rah, free India wins gold!” But the story Reema Kagti wanted to tell was something about older generations and younger generations, missing your own chance but dreaming of it for others after you, and the sudden shock of change you longed for but didn’t realize what it would mean when it happened. The best parts of the story take place when no one is playing hockey, when you feel all those things that are stopping them from playing, a very particular pain of colonialism that Reema manages to draw out, that feeling of being meant to do something and not allowed to do it. Each of the leads, Akshay Kumar and Kunal Kapoor and Amit Sadh and Sunny Kaushal and Vineet Kumar Singh, has a full story that digs into what people in India were going through at that time. It’s an impressive balancing act in the script, to keep all those balls in the air simultaneously. And sometimes the balls just disappear. But that doesn’t feel like an accident, it feels like life and like history. Sometimes people are cut off from your life like they were never there, sometimes time marches forward and keeps you apart. No, the real problem is that Amit Sadh is just TOO GOOD. His character and Sunny Kaushal’s are supposed to balance each other, but they don’t. Amit towers over him, I find myself far more interested in him than in anything Sunny is doing. Even Vineet Kumar Singh with his quieter energy struggles against Amit’s onslaught. Kunal Kapoor, of course, can still a scene just by breathing and existing, so he has no problem. And Akshay treads that line between comic and heroic perfectly, in a way only he can. Mouni Roy is the only significant female role, as Akshay’s wife. And she is fine. Incredibly distinctive face, and playing an argumentative but reluctantly supportive wife, so much better than the usual wet blanket “but you have to be sensible!” kind of wife. And their relationship falls into the kind of cheerfully henpecked and loving it variety that Akshay plays so well. I like to think because it is what his marriage is like in real life, rather than that is how he chooses to play his marriage in real life since it is easy for him to play. But it is Indian history that is the real star. The upheavals of the WWII era, trying to figure out what to do when dragged into a fight that was not their own, then the inevitability of Independence and preparing for it in the post-war years, the shock of partition, and the struggle to recover. All played out safely and cleanly on a hockey field. 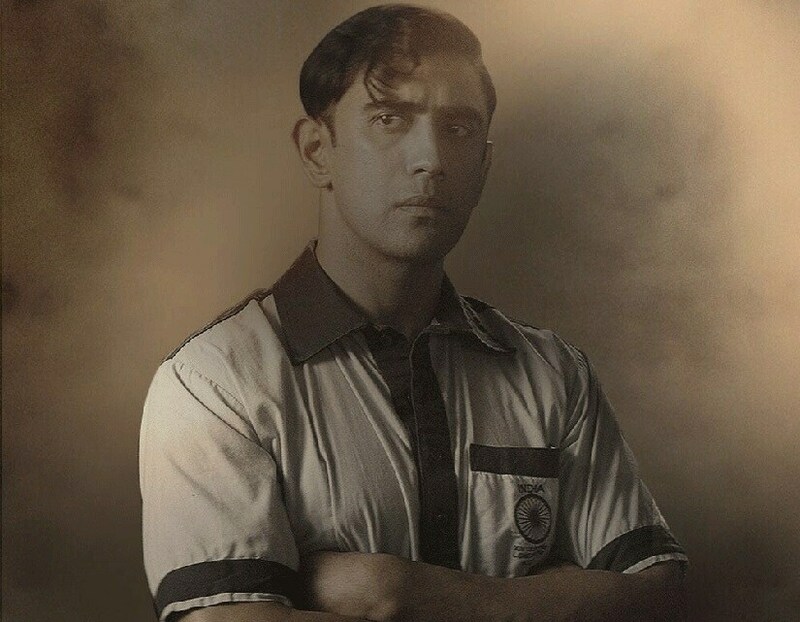 In 1936 Berlin, Kunal Kapoor is the Indian team captain and Akshay Kumar is the lowly assistant manager. But Akshay rescues a Free India flag from a protester and uses it in a locker room speech to inspire the team and win the match. And then time flies past, the next 2 Olympics are canceled because of the war, the Free India movement goes on, Akshay becomes a drunk and is thrown out of hockey, going so low as to pawn his wife’s jewelry. Until 1946, when it is clear the British will leave and the 1948 Olympics are announced for London. Akshay begs to put together a team now, while the country is still technically British, with the promise that by 1948 they will be playing for free India. He goes to Kunal who refuses to be captain, saying his time is past but suggesting Vineet Kumar Singh, his teammate, as captain. Akshay convinces Vineet and then also finds Sunny Kaushal, a Punjabi son of a freedom fighter. And Amit Sadh, a prince from UP. The team comes together, although Amit resents giving up his usual position to Sunny and has a hard time learning to pass the ball. And then it all falls apart once Independence actually arrives. The 2 white players feel uncomfortable and plan to immigrate to Australia. And two of the 4 Muslim players end up going to Pakistan, including Vineet, the captain of the team who leaves for Pakistan after nearly escaping death thanks to Sunny’s intervention in the Amritsar riots. Akshay’s perfect team has fallen apart. Akshay decides to rebuild, with Kunal’s help. Kunal still won’t play, but he will help train. They can’t get funding since the money is in holding post-Independence, so they move into a Buddhist temple that offers them space and Mouni Roy (Akshay’s wife) volunteers to provide their food. The team still isn’t pulling together, but Kunal gives them an exercise to help them learn to work as a team and it seems to work. There is one last hiccup when Akshay’s jealous fellow manager gets him drunk at a party before leaving for London and has him thrown off as manager. In London, the Pakistani and Indian players greet each other happily but the British have evilly set them to play each other, guaranteeing that one of the strongest teams will be knocked out before the semi-finals. Akshay’s replacement refuses to make an issue of this, the team goes on strike, finally Akshay is sent to London and the Pakistani and Indian teams work together to make sure they are appropriately matched. Vineet and Akshay are friendly, Akshay wishes him luck before the Pakistan-British match, but Pakistan loses. Akshay plans to keep Sunny a secret and use him in the semi-finals, but Sunny is increasingly unhappy not playing and confronts Amit about it, accusing him of keeping him off the list out of jealousy. Amit is offended and they almost come to blows. The next day, Amit and the team captain and the other manager insist Sunny not play as a matter of discipline since he started a fight with the team vice-captain. Akshay tries to stop it, but Sunny is kept off the field and India barely wins the match. In the finals, they are losing badly and at halftime Akshay gives a speech reminding them that they are all playing for the Indian flag, not for themselves, and begging them to let Sunny play. Sunny plays, he and Amit work together, and they win the match. YAAAAAY! There were three things that surprised me about this movie, three things that were evocative of emotions and memories and all those things that usually don’t find their way into sports films. The first is the very beginning, and the careful way Akshay and Kunal and Vineet play their moments of playing for British India. They are stars, getting cheers and making goals, but they are also prisoners. 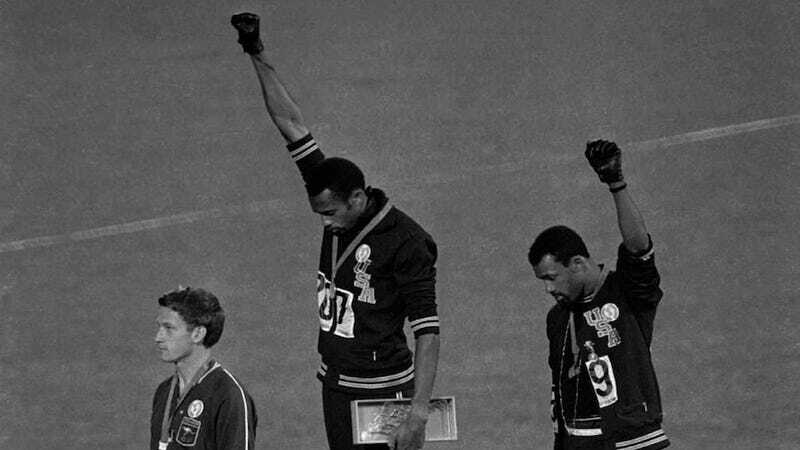 It’s a familiar situation for athletes, it’s why in 1968 Tommie Smith and Juan Carlos gave the Black Power salute, or today the battle rages over kneeling during the national anthem instead of standing at NFL games. Their physical talent gets them fame, but they aren’t supposed to think as well. There is a voice over explaining the situation from Akshay, but no dialogue in the opening sequence. We just see carefully blank faces as Akshay and the players are loaded into a bus under guard, and then watch as the protesters are taken and beaten. There is a moment where it feels like Kunal wants to say something, but can’t, or isn’t sure what it is he could say, a very difficult acting moment that he lands perfectly. Also perfect is the reflexive way Akshay reaches out to catch the flag when it is tossed in the air and then shoves it into his jacket. They aren’t fighters for independence, not exactly, but it is something they want in their hearts and don’t know how to fight for it. But want it enough to feel like they should be doing something. Akshay is similarly perfect in a brief moment when we see a newspaper flash a headline about Gandhi telling people to burn their British clothing and he calmly lights a match and throws it in a trashcan, wearing a dhoti for the first time in the film, a dhoti which he wears in every scene after that. This is not what I was expecting from this film, I was expecting the usually anger and “boo British!” stuff. But instead of was the kind of crippled feeling of being so de-humanized that you aren’t even sure how to feel anger any more. Akshay during halftime gives a really cliched speech about playing for the Indian flag, but it works, because they sold the moments before it, the sort of blind grasping for pride and identity, and so finally finding it in the flag and feeling filled with it works. And what works the best is the medal ceremony, Akshay pulling out a corner of the flag and the team slowly turning slightly off center so that they face it, their real flag, instead of the British one. A tiny moment of feeling like they have a country of their own even when they don’t. The other thing I wasn’t expecting was the weight of Akshay and Kunal and Vineet’s journey versus Amit and Sunny’s. That sense of the older generation having been through so much, and yet somehow continuing to move forward and pass their wisdom on to the next generation. While Amit and Sunny have no idea of their struggles, can’t possibly have an idea of them, are just too different. They are young and hopeful and ready, while Akshay and Kunal and Vineet are beaten and cautious and tired. Those 12 years between Olympics, while Akshay watched his life trickle away, and yet somehow still found himself able to come back and try again 12 years older, that’s important. And the film doesn’t skip over that, the opening montage really gives you the feel of everything that happened and everything that was lost in that time. But the real surprise to me, as it was to the characters, is what happened after Partition. And that was surely a deliberate choice on the part of Reema Kagti and a brilliant use of the predictability of the sports film format. We know how this goes, the team comes together, trains together, celebrates, then goes to the big match and something goes wrong, and then they win in the end. We had the team coming together, everything is perfect, we are ready for the next bit, the final obstacle and then the winning. Only, instead, everything goes off track. First the white players leave, all but one. And then the riots happen and some of the Muslim players leave, not all, but some. And suddenly it is only half a team left. And I think that is the clearest evocation I have seen of what happens when a country finally gets Independence. It’s never what you think it will be. America had 5 years between the end of our revolution and actually completing the constitution. And that’s kind of standard, you get your freedom, and then you suddenly realize that your problems aren’t over, you just have a new set of them. British India was a place where white and brown, Hindu and Sikh and Muslim, all were united in wanting to be free. But Independent India was a place where suddenly not everyone felt they belonged, the “team” that had won so much and done so well before was falling apart. Something new had to be built up. Which is where Amit Sadh and Sunny Kaushal’s characters come into play. It’s not a coincidence that these were the two chosen to be the focus of the story. Amit is a prince, raised in a palace with every luxury. Sunny is the son of a Sikh revolutionary, raised in a working household. Sunny joins the police because he is forced to, forced to play for their hockey team. Amit is a star player who will not share the ball on the field, but off it he will literally give the clothes from his back (as we see in his introductory scene) to a begger in his kingdom. Amit has an old-fashioned sense of responsibility to others, but that does not translate to a sense of others as equals to him. He will casually show up to practice late but be very police about it. He will except his teammates to carry his luggage and make his bed, because it won’t occur to him to do those things himself. And Sunny has the attitude of a Sikh freedom fighter, that everyone is equal. He is no better than Amit and Amit is no better than him. He can’t understand the code of honor Amit lives by which means that even if they are not equals, he will not knowingly harm him. Amit has to learn to bow down and become one with his fellow citizens, and Sunny has to learn to trust and understand others. There’s an odd sort of foreshadowing in them, Amit’s ancestral royals will slowly give up their estates to independent India in the next few years, his family’s title will be wiped away. Because they chose to do it, because it was the right thing to do for their people, that same urge that lead him to give up all the clothes on his body to a beggar will be what makes his family hand over their title and wealth to the Indian government. And Sunny’s side, the Punjabi Sikh’s in later years will come together in distrust of the rest of the country, will want to break off and be their own entity, just as Sunny tries to walk away from the rest of the team. All of this is good, but this isn’t to say it’s a perfect movie. There’s quite a bit of “filler”, no reason to include Akshay’s falling into ill favor and then being forgiven and sent to London after all. Sunny Kaushal just did not impress me, and Amit Sadh impressed me so much that I wanted more of him. There were also two tiny historical inaccuracies, both of which you could argue for being accurate. At one point, Amit is told “oh, don’t be a Devdas”. And yes, Devdas was a popular novel, and a popular film in the 1930s. But would that necessarily be a common phrase in 1948, long after the 1930s film and long before the 1950s version? Anyway, I will forgive it because the subtitles translated it as “oh, don’t sulk” and I love the idea of “Devdas” translating to “sulk”. It’s so perfect! Oh, and during a scene set in New York in 1948, the music in the background is the Benny Goodman version of “Sing Sing Sing” which came out in 1937. But I suppose they could be playing an old record. And I will forgive it because it is a great song. I appreciate Reema reminding the audience that every part is important, that you can’t afford to lose anyone from the Indian team, that it was a Muslim player who made the save in the semi-finals, that it wasn’t just the evil British who left in 1947 but also perfectly nice young white men who were raised in India but no longer felt comfortable there, that the Muslim players went to Pakistan after a lot of soul-searching and agony and physical danger, not a simple thing. And that it was also not a simple thing for those who stayed. But I want to point out, just as I did in the no spoilers review, that there are no Muslim actors in this film. Did it seem odd to you that I had to use the name “Vineet” to describe a character who left India for Pakistan after nearly being killed for being Muslim? It seemed odd to me too. For comparison (again, just based on cast list names) Chak De India had 2 Christians and a Muslim in the cast, in addition to Shahrukh Khan as the Muslim lead. And considering she made this whole movie about accepting every part of India, I am hoping Reema doesn’t mind that I point this out. It’s not her, it’s every movie, and I am going to try to point it out for every movie, especially those in which Islamic-Indian identity is a plot point. This was indeed a very interesting movie! Amit is one of those actors that I look up and realize that I’ve seen several times and never recognize. And I loved the interplay between Akshay and his wife. If would have been easy to make her a two-dimensional character. Thanks for suggesting it! Glad you liked it! I love Amit, but I fall in love with him all over again in every character. I loved him in Running Shaadi, and in Sultan, and in this. But each time I thought “oh, who is this great actor? I think I love him!” and then I looked him up and went “oh right, I already loved him, I just didn’t recognize him.” It’s like 50 First dates. I haven’t read your post yet, cuz I don’t wanna be spoiled, but I thought I’d contribute in the comments anyways. I def wanna watch Gold, then Soorma (is diljit in this? I understand that he is a good actor), and I have yet to see Mary Kom or Bhaag Milka Bhaag. Any other sports biopics you recommend? There was one which involved rahul bose, one about a 13YO girl, and (not quite sip ports but similar ethos), one about a man that dug a tunnel(?) through a mountain to create a pathway from his village to the next. A 101 on biopics, or specifically on sports biopics, might be interesting. Speaking of biopics, the Nandita Das film Manto, biopic on the famous author-poet, has an interesting format, interweaving his life with the lives of his stories and characters, chronologically with when in his life he wrote each piece. On Netflix or Amazon now, just reached this week. If/when you decide to do a review of it,I will leave comments there. Soorma has Diljit as the hero and he is quite good in the role, but I think his older brother actor Angad Bedi secretly steals the film from him. 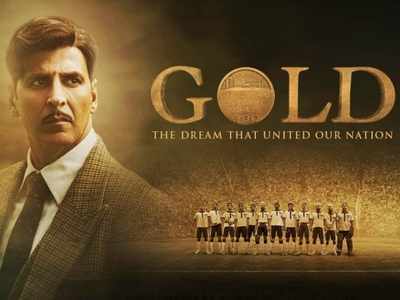 Gold is I think the slightly better made movie but it is a little more predictable while Soorma takes an unexpected turn into family drama instead of triumphal sports hero story. So, yes! You should watch both! I like the idea of doing a 101 of sports bios. There weren’t any until just a few years ago, and now there are so many! Bhaag Milkha Bhaag is really good, but watch out, very explicit Partition images.